Cancer has returned! The UK Death Metal band has graced us with their sixth full length album Shadow Gripped. The band have been going strong for 30 years and for this album, all three core members have returned to deliver the classic death metal sound they are renowned for. The 10 track LP also features guitarist Anders Nyström of Bloodbath & Katatonia, whom was clearly excited to participate in the return of the magnificent ‘gorefest’ that is Shadow Gripped. The band will also be attending the Damnation Festival, amongst some real heavy hitters such as Napalm Death and Ihsahn, and are quite excited to be a part of the festivities. With the first song "Down the Steps", we are transported in time to Cancer's classic death metal style. Starting off slowly but quickly building momentum, the solid old-school death metal sound brings us to the present, with classic riffs and the fantastic deep, guttural vocals that make Cancer one of the best bands in the death metal genre. "Garotte" and "Ball Cutter" (what a fantastically hideous name for a death metal song) bring us repetitive, heavy-hitting drums with the slow, steady eerie snarls and growls - with Walker enunciating every horrid and vulgar detail of torture and dismemberment in each song, the carnage is only just beginning! "The Infocidal" begins with a rasping guitar solo and Stokes seems to draw from the depths of his soul for this sepulchral sound. It is a most definite headbanger; double-bass drums pounding as the metal screams lie perfectly over the gritty guitar. One of the strongest tracks on the album, it displays the talents of all three members in true death metal fashion. "Crimes So Vile" begins with a slow tempo, quickly turning to a brisk beat with unforgettable lyrics such as, ".... Crimes so vile, truth in denial, raped and defiled...." that most definitely grab your attention and with each word Walker spits out, you are thumping your head in response. The underlying deep bass gives the song an even more sinister tone, making it one of the best on the album. 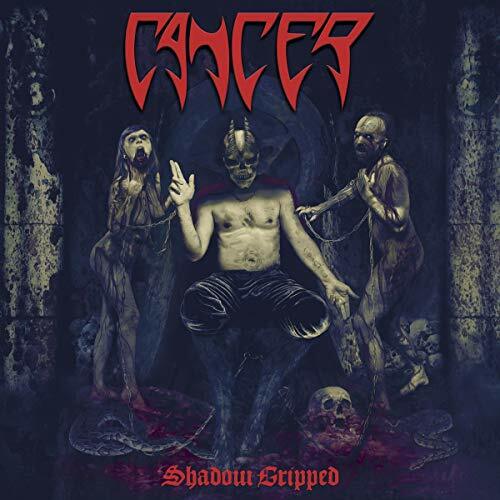 The title track, "Shadow Gripped", does not disappoint, starting with marvellous work on the fret board of the guitar, and the steady guttural vocals, the song boasts a heavy, throbbing beat that is impossible not to appreciate if you are a true death metal lover. At the four minute mark, an incredible guitar solo kicks in and adds to the already groovy beat of this infectious song; I dare you NOT to bang your head and throw up your horns to this one! With this album, Cancer has brought the METAL back to Death Metal, the gritty vocal sound of Walker, along with the blast beats and infectious but not over the top guitar riffs and solos. Quite impressive for men whom have been rocking for 30 years. With infectious grooves and lyrics that will have you wishing there were just one more tune, this truly is classic, timeless Death Metal! This is a ‘must-have’ album of 2018 and I’m certain will be included in many ‘Top Ten’ lists towards the end of the year.